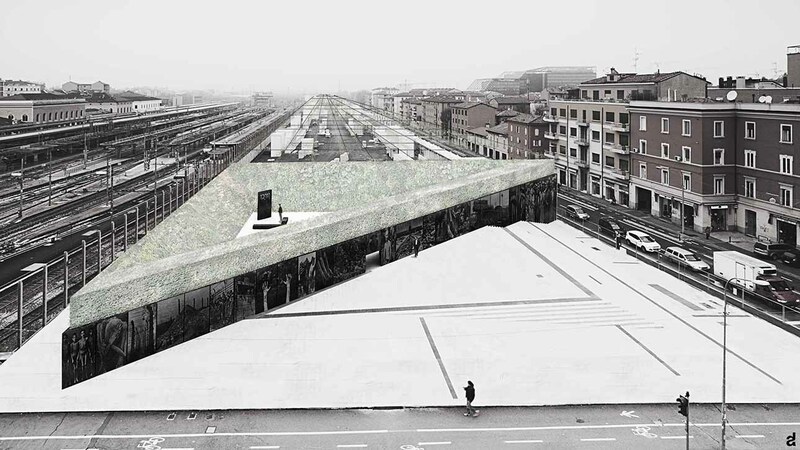 The new "Shoah memorial" of Bologna will be built in the square, recently completed, between Via Matteotti and Via Carracci. A paved area, slightly lifted from the road, dominates the places of service (basements) connected to the station of TAV. 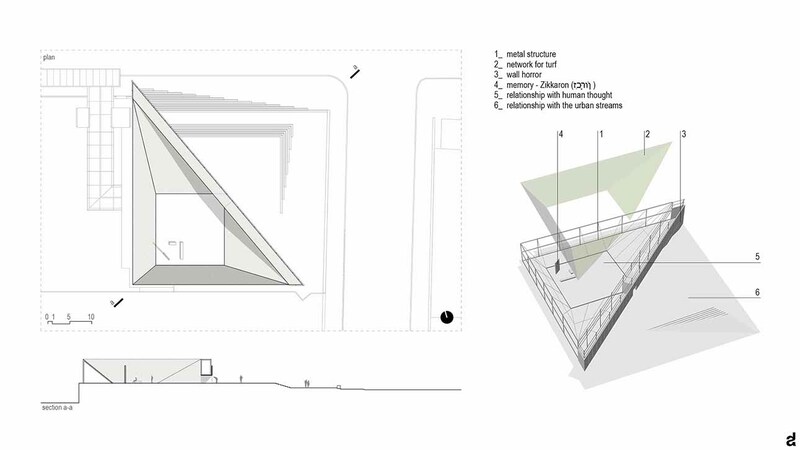 Here the presence of a large wall ventilation, which acts as a ventilated fireplace, dominates the entire public space. 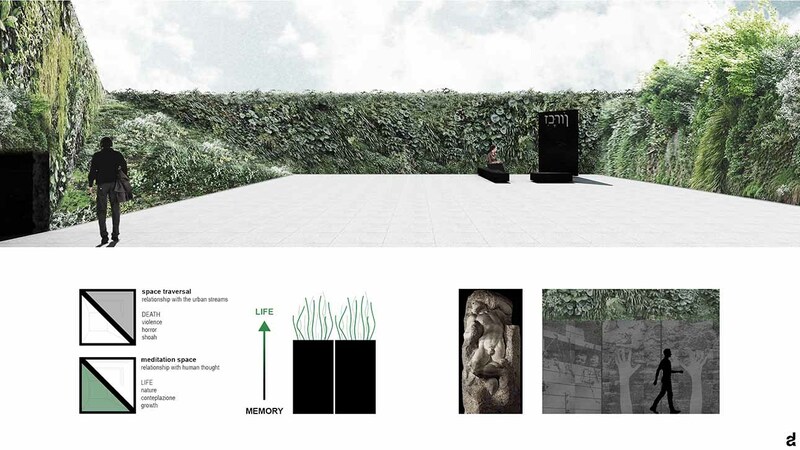 The design choicefor the memorial is based on the two portions of the existing wall. In fact, the idea is to rebuild it, following its same track, with a single sign that cuts diagonally across the entire space (almost squared) ofthe square. Its clean cut defines two different environments of urban space, which also represent the two different visions of the Shoah. The space to the east of the wall opens to the two roads, and it is closelyrelated to the urban streams. On this side are represented the atrocities, the violences and deaths caused by the madness; all is represented explicitly and in cruel way, to all the people who pass through this place. The inner part (to the west) is the most intimate; a place of thought that has an awkward entrance door at the center of the wall, where the walls of the perimeter (built with poles, ropes and steel meshes),are entirely covered with a tree line that cuts the visual of this space, separating the sky and pavement. Here, there are two benches around a metal panel, indicating the very essence of this place of meditation and contemplation. The portion of the wall facing the street shows, on some steel panels, the violent and cruel images of the Shoah. A sense of liberation of matter where, as in the "prison" of Michelangelo, the characters wants to free themselves from a mass that hinder and oppress them. All this has the task of keeping imprinted in mind the inhumanity of what it was, but no one will ever change it or delete it. Moreoverthe memory of an event has the ability to keep it forever alive in all of us, because memory generates existence. From this came the idea of reviving the life from these terrible events; in fact from the cold steel panels, the life manifests itself through the vegetation; which, with its constant growth, is able to cover the entire wall and all the space behind it. In this place of thought, enclosed by green, the only metal plate is not marked by any images; a blank panel, a "blank sheet", with engraved above (in Hebrew) the term Zikkaron. The absence of figures symbolizes the fact that, through remembrance and memory, each of us can rewrite a new page of history; never forgetting what happened, but surely thinking about a future where all this can not and must not exist.